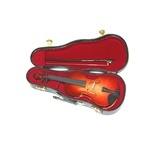 Miniature Violin with Case - A beautifully crafted Miniature Violin that makes a great gift for the violin player in your life! Comes in a magnificent case lined with velvet to protect the violin. Exquisitely detailed and include miniature bow! Made of wood. Approx. 7"L.
More Music Gift Jewelry offered from Drum Bum. 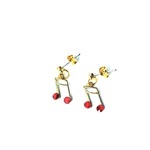 Attractive pierced earrings with red gems to show off her love of music!